For those of us who have lived for many years in the Edwardian terraces of the St Quintin Estate in North Kensington i.e. Wallingford Avenue, Kelfield and Oxford Gardens, Kingsbridge, Balliol, Finstock and Highlever Roads, we may be the last generation to have witnessed the original layout of the houses and have some idea of how they were used in the early years after they were built. As and when our houses are now being sold, one after another they are changing beyond recognition. Basements are excavated stretching beyond the length of the house. Interior walls and some exterior are torn down to create vast kitchens, spacious light living areas, and en suite bathrooms for all. Any reminders of the past and how the houses were used are disappearing. Gone – the familiar tiled paths, the tiled halls marking out the layout of the downstairs, gone the fireplaces in most rooms, gone the picture rails and ceiling decorations, the built in glass fronted dressers and often, the traditional banister rails. Not to say that the results of the new generation of ‘updating’ are not impressive and a vast improvement (they are), but all links with the past disappear in the process. So this blog entry is an attempt to record the clues that are still visible in our houses before we too sell and move on. We also have the memories of what our generation found when we moved in. 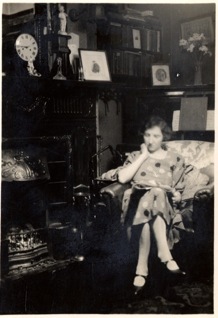 So first , to take us right back, two photos of a house in Highlever Road in the 1920s found recently in RBK&C Local Studies, one a rare shot of an interior. Below, Jennifer records her memories of living on Kelfield Gardens and further on, Audrey describes her home on Highlever Road. Finally at the end there is a slide show of various features from around the streets. The photos are from similar houses in Kelfield Gardens that retain original features similar to the one described below. 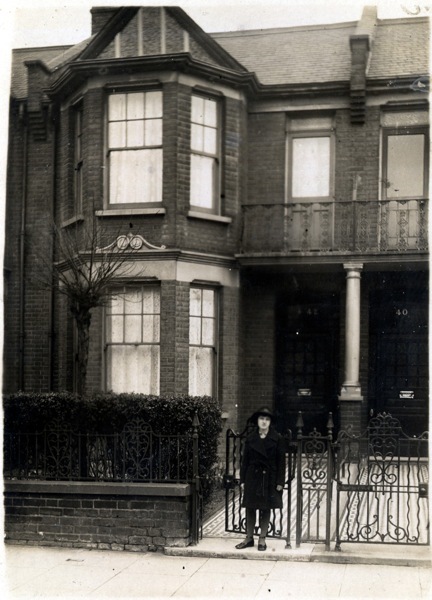 My family had two homes in Kelfield Gardens in the section between Wallingford Avenue and Highlever Road. The first was on the southern side next to a building site, the result of the WW2 bomb at the cross roads of Kelfield and Wallingford. Having rented the upper half for a while the landlord offered to sell the house to my parents as sitting tenants. They then became landlords to the people downstairs. View west across the back gardens of the houses in Kelfield Gardens. 2015. We had the upper floor — the front room with a bay window enabled me to watch the houses being rebuilt. It fascinated me but not my mother because of the “nasty men” on site. There was a lack of portaloos in those days! This was about 1950. There was a sitting room, double and single bedroom, a toilet, bathroom and airing cupboard and a room at the back overlooking the small garden. This rear room was our living room. It had an open fire and apart from the corner cupboard there were two more, one housed the sink and the other one the gas stove. Once the doors to these were shut there was no evidence of cooking or cleaning to be seen. My mother ironed using flat irons, heated on the gas stove. Once hot these had to be cleaned to remove any soot, by which time there was a limited amount of heat left so she had to start over again. However, she then progressed to an electric iron, heated by being plugged, not into a wall socket as now, but by removing the overhead light bulb and plugging it into the bayonet socket. All water had to be heated by kettle or, for a bath by the geyser, which made a nasty bang when lighted. 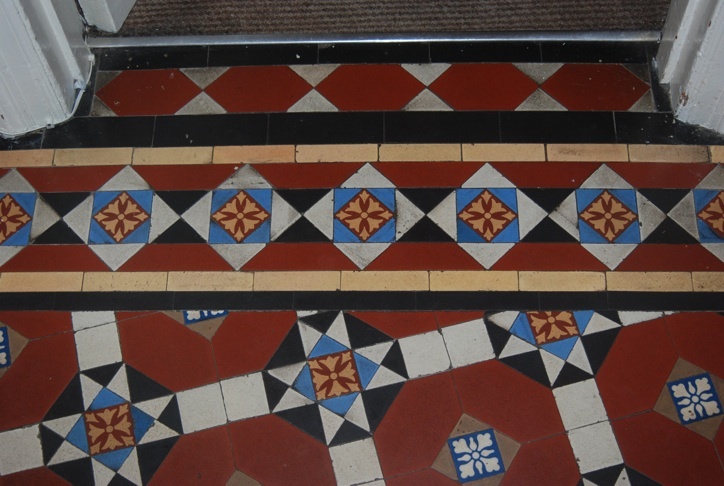 Detail from the Hall floor, Kelfield Gardens. 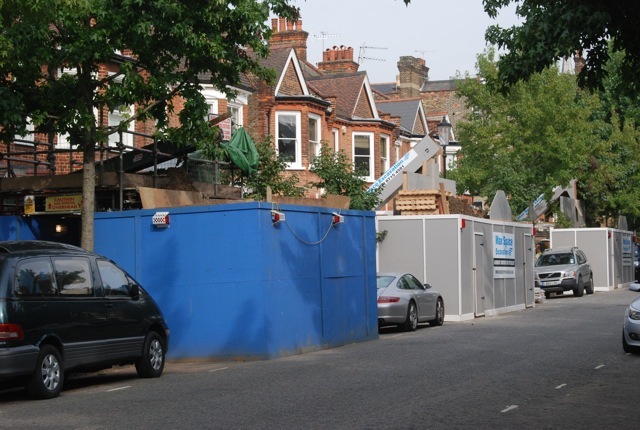 We then moved across the road to the northern side of Kelfield Gardens buying the house with vacant possession of the lower half. This time it was bought with sitting tenants upstairs and we lived on the ground floor. Two elderly sisters were upstairs, local ladies who were friendly with several of our neighbours as they were from the St. Clement’s area of Notting Dale and knew each other from school days. The elder had been in service all her life whereas her sister worked at Eastman’s, the cleaners in Acton Vale. There was also a commercial artist, a milliner whose hat shop was in the station at Hammersmith, a couple who were refugees, office workers, a rabbi, a policeman, one of the laundry families, a plasterer, builders, an emergency trained teacher plus a Portobello Road trader. It was quite a mixed community. This house had “original features” in abundance. The hall floor was tiled in a variety of colours, the doors were in very dark graining with brass handles and the hall was decorated in an almost black wallpaper on the top half with deep cream lincrusta on the lower part. Each room had an open fireplace, the mantles being in marble, wood or iron, depending on the status of the room. Ceilings were horsehair and plaster with heavy covings and deep drops before the picture rail. 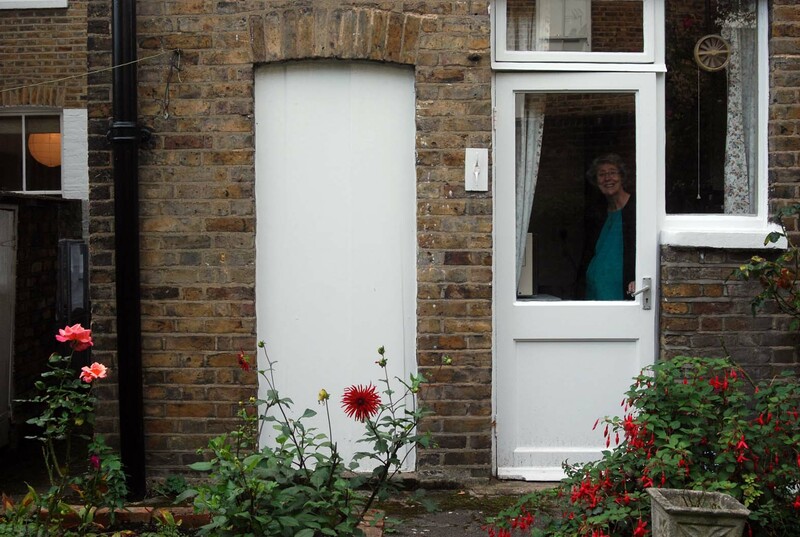 The front door to the street was shared by us all and there was no separate entrances once inside as in today’s self contained flats. Thus the whole house was open to everyone who lived in it and required co-operation and respect for one another. This was a happy house and it worked well, neither half encroached on the other and we only visited by invitation even taking turns to clean the stairs. As we had the lower flat we had no bathroom so we shared with the upstairs tenants. We each had “bath nights” and kept out of each others’ way to ensure privacy for one another. We still had no hot water on tap so bath water was by way of the water heater yet again. Our half of the house had a toilet, plus two bedrooms, a kitchen and back room reached by a long passage with its walk-in larder backing on to a couple of coal cellars and doors leading on to the garden. Kelfield Gardens original kitchen/ scullery tiles. Our kitchen would have been the original scullery with red floor tiles and an alcove for the copper. The stove was housed in this alcove, first gas and then electric. There was a door opening on to a passage leading to the garden. There was no ’fridge or washing machine so the washing was boiled on a free standing gas ring. The garden was walled and long, about 70 feet with plenty of room for playing and for the dog to chase after cats who plagued her, strolling along the back wall, twitching their tails in her direction, a challenge she could not refuse. The ladies upstairs had the larger flat with similar accommodation as we had had before along with the sink and cooker in cupboards built to hide them away. When the elder lady died I was offered her bedroom so that we, downstairs, could expand and have a sitting room again. Kelfield Gardens. Rear view showing the original back extension housing a larder on each floor. Eventually we had the opportunity of buying the freehold. This had to be done in cash taking the actual money — a large sum — to the solicitor. By the early 60s we had the whole house to ourselves which proved over large to maintain, and heat so we moved to a more compact house with constant hot water, even though it was by an ideal boiler and, by now, a ’fridge and washing machine with a bath room we didn’t need to share. n.b Some of the houses in Kelfield Gardens were purpose built as two flats and had two bathrooms and two larders as can be seen in the photo of a house between Balliol Road and Highlever Road. I moved into this house in 1964 with my parents. The previous owners had died and I think most of the house was in its original condition. 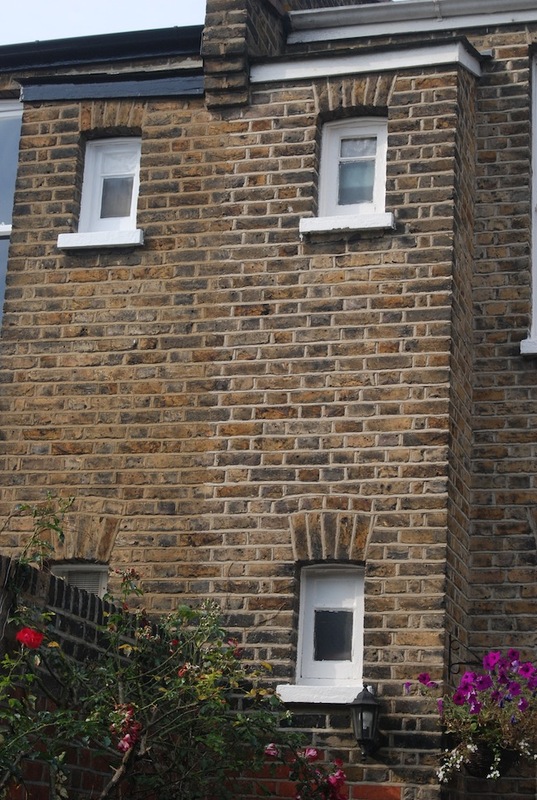 The main alteration had been the replacement of the sash windows by leaded ones. The St Quintin Estate had been built 1904/1906. The houses were built in a variety of lay-outs. No.60 was identical in its plan to No.62 but quite different from nos. 56 & 58. Only 2 people had been living in 60 prior to the sale but nos. 58 & 62 had tenants in flats. The ground floor consisted of 4 rooms – a sitting room, a dining room, a breakfast room all opening from the hall and a kitchen opening from the breakfast room. A door opened out to the garden from the kitchen where there was access to the toilet. There was also a door from the hall opening to the side of the garden. The first floor consisted of 4 bedrooms, a bathroom and a toilet all leading off the landing. The master bedroom stretches the width of the house and had a door opening onto a small balcony. Leading from the front door was a long tiled hall. Facing the front door were the stairs which had the original banister and supports. 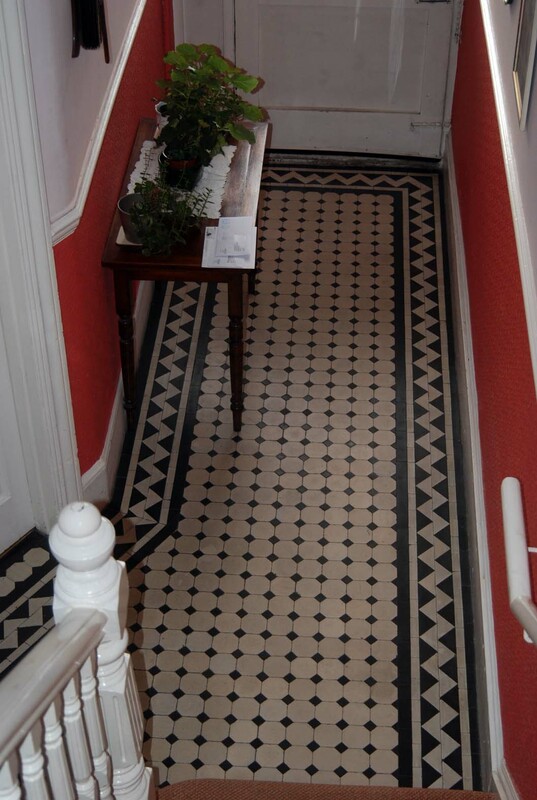 The hall floor was tiled through to the door of the breakfast room. Further down, on the left was a cupboard under the stairs and on the right was a small area with a door leading to the back garden. The hall remains the same except for the door to the back garden which has been blocked up and the central heating boiler has been installed there on the top of a very useful cupboard. 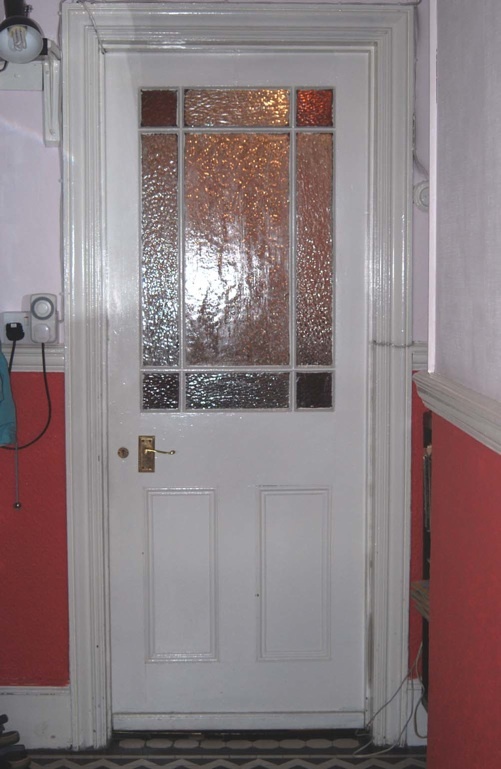 The three doors to the sitting room, the dining room and the breakfast room are the same as when we moved in. The main alteration here has been the removal of the fire surround and a glowing gas-fire installed. It also has a central heating radiator. 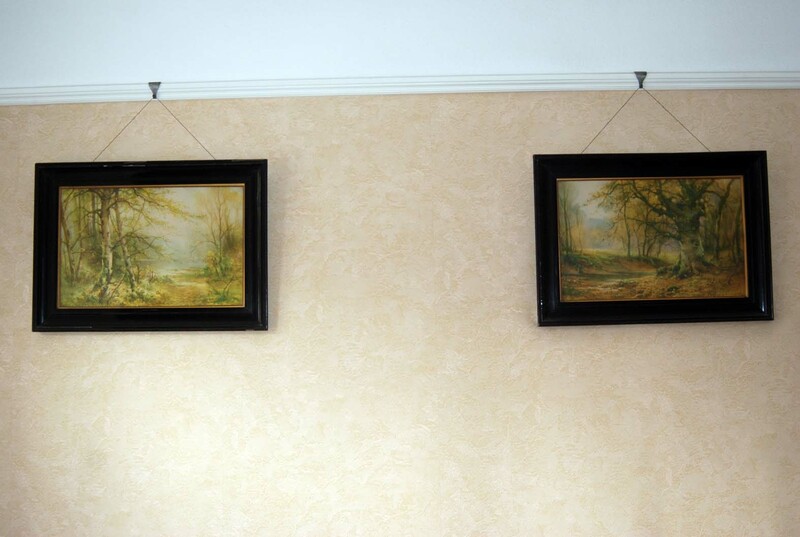 The ceiling moulding and picture rail are original. 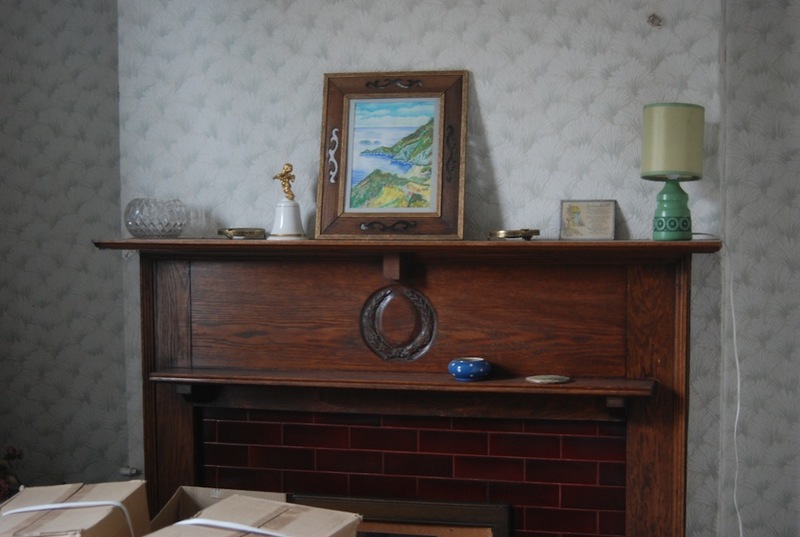 This room still has the original fire surround and mantelpiece although the fireplace has been blocked up as the room has central heating. I use the room mainly as an office but it is a dining room when I have visitors. It also made a good bedroom for my mother when she needed it. I believe this is the proper name for the room next to the kitchen but I always refer to it as “the kitchen”. 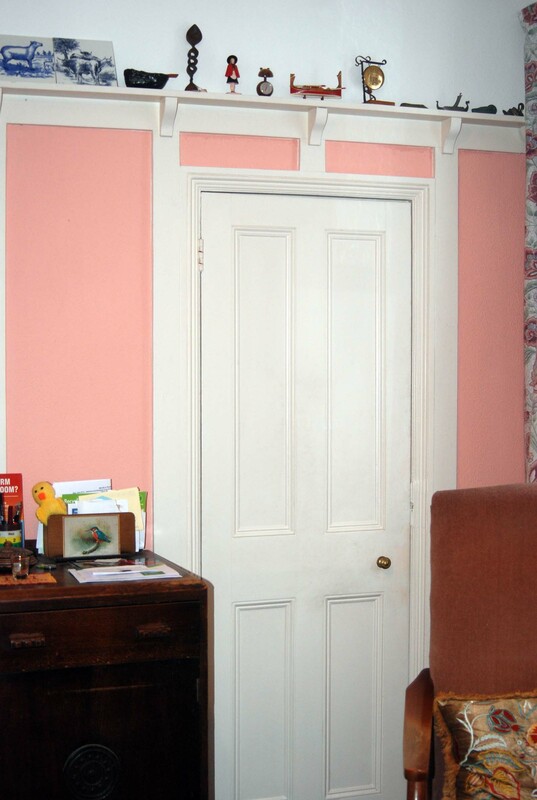 This room has retained several original features. There is a door in one corner leading to a large larder. 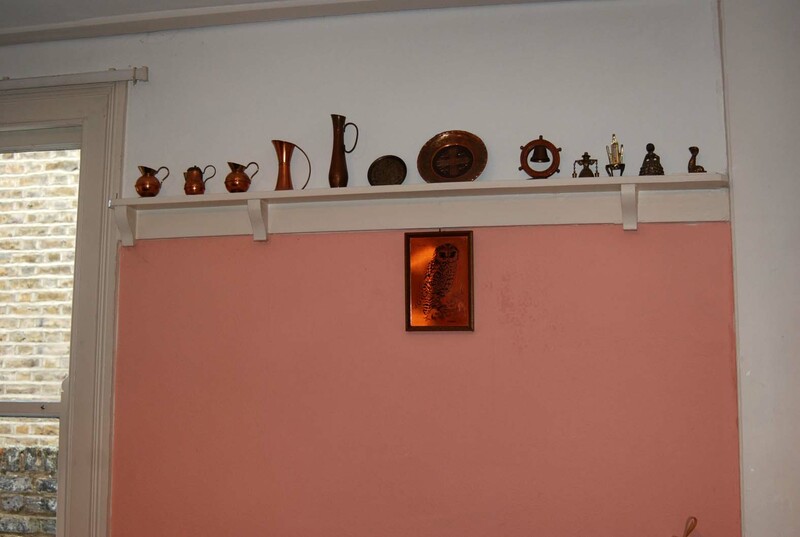 Instead of a picture rail there is a shelf and the walls are lined with vertical wooden struts. The original fireplace has been replaced by a tiled surround and a gas fire. 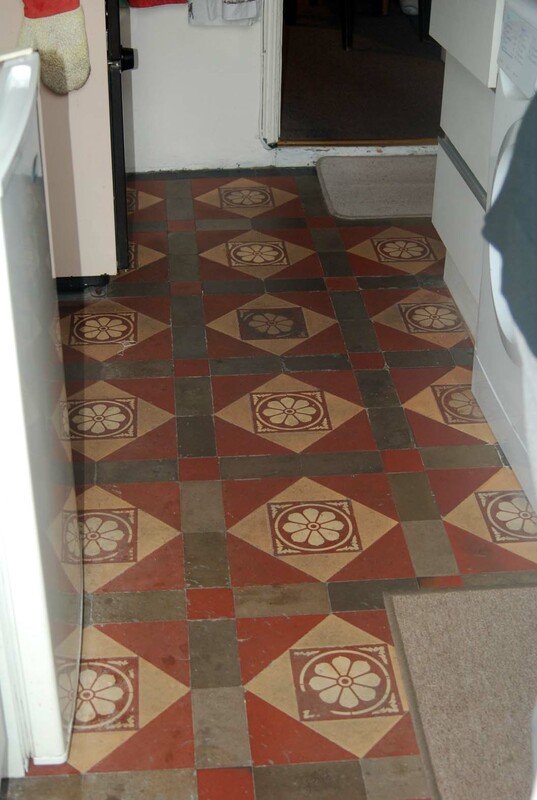 Original tiled floor in the Kitchen/Scullery. 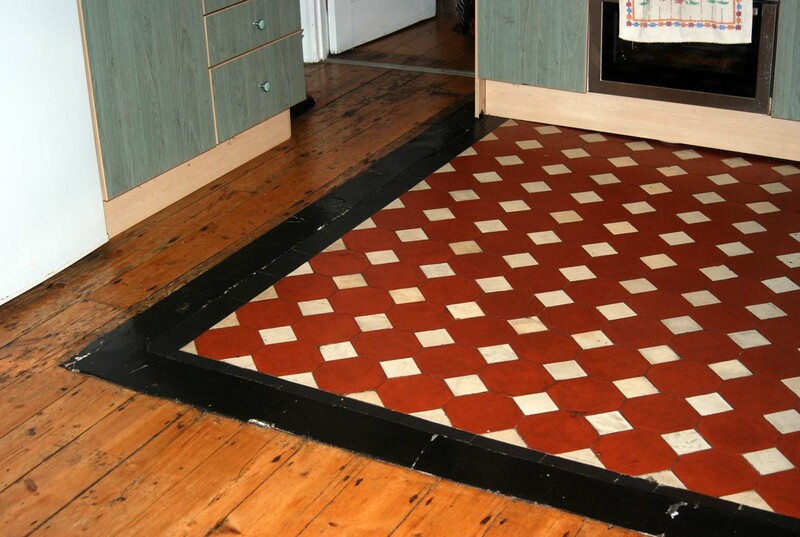 The kitchen retains its original tiled floor but that and the doors are the only original features remaining. A door leads to a large cupboard which housed the original owners’ cooker. It now has a door opening into the toilet which originally had to be entered from the garden and there is a shower there. Much of this floor remains as it was in 1964 except that the bathroom wall was removed to make a larger room housing toilet and bath. We retained a very useful airing cupboard on the landing. 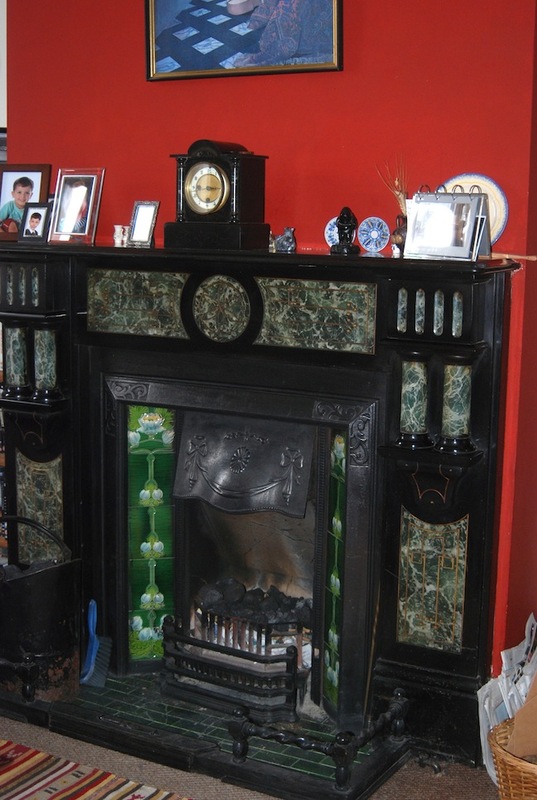 Two bedrooms have had the fireplaces removed, one room retains the original fire place but it is blocked and the other room has an original open fire but it has never been used. Photos are by Sue Snyder, Ernest Godin and Dave Hucker. 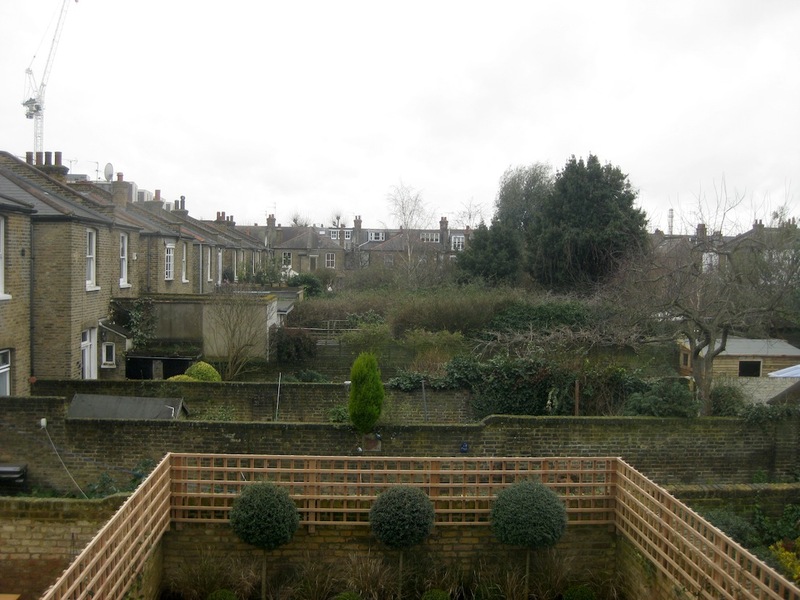 Gallery | This entry was posted in St Quintin Park, Streets, Uncategorized and tagged 1920s, 1950s, 1960s, Balliol, basements., Fireplaces, Highlever, Kelfield, Kingsbridge, Oxford Gardens, tiles, Wallingford. Bookmark the permalink. I remember a Polish family lived above us. I played with the boy from this family in our shared back garden, his name was, Richard. Our back garden backed onto a family where the dad was an engine driver. I played with his son, but cannot remember his name. We both got into trouble into causing a fire made from turpintine. I think we were aged about 4/5. Does anyone recall these people or events. Or have photos of the interior of No 1 Nascot Street from the 1950’s. I remember sharing a bedroom with my brother with windows that opened ono the rear garden. We moved into our house in Wallingford Avenue in 1976. The previous owners had lived there since the 1930s. They had no children, so they lived upstairs and then had let the downstairs as a one bedroom flat, but not the front room which they kept as their own spare bedroom. There was still an Anderson air raid shelter in the garden disguised as a rockery and a very tall flag pole at the end of the garden. In the loft we found a tattered threadbare union jack and two rusty parrot cages. The house had been built around 1904, originally as a single family unit. Downstairs the original layout of the house would originally have been from front to back as follows: Front Room/Parlour, then the Breakfast Room and original Kitchen where cooking would have taken place, as the fireplace was from the 1930s or so and probably replaced the old coal-fired kitchen range. Either side of this were built in glass fronted dressers in both alcoves (still there). After the toilet, the next room with a lower tiled floor, would have been the scullery with a sink and a door onto the side passage to the garden. Also in one corner there appeared to have been a chimney which from the outside you could clearly see leading up to the roof. Perhaps this could have been for heating the ‘copper’ for doing the laundry. Later, maybe in the 1930s, gas replaced the coal for heating and cooking, so this became home for the gas cooker and the kitchen for both cooking, washing up and laundry. When the downstairs was a separate flat the kitchen also had to be the bathroom so a bath was put under a kitchen unit! Under the floor covering in the Kitchen/Breakfast Room we found one of those patterned oil cloths patterned to look like a persian carpet. The owner had fully ‘modernised the house over the years replacing panelled doors with flush doors and glass panels, blocking up and paneling over fireplaces, removing old gas wall light fittings, etc. We, of course, wanted to replace all the original features! In 1976 the owners lived upstairs using the large front bedroom as their living room and the back room overlooking the garden as a dining room. Next to this room was the small room they used as a kitchen. In fact we still have the old wooden built-in units of their kitchen on one wall. One thing I did notice when we moved in. The summer of 1976 was very hot and some of the older residents of the area had a special striped canvas curtain (like deckchair covering) that they would hang and pull across the front porch. Was this to protect the paintwork from the blistering sun or was it for privacy if they wanted to leave the front door wide open to cool the house off? We still have the hooks in place, but no curtain! Hi, did you use to have a Grey or Green Triumph bike ? Hi David, I think our mums used to be good friends. I remember being in your house a few times and listening to some “old” Cliff Richard records, “Move It” etc. Not sure but I think I was nearer your brother, I think Alan’s age ? I remember you taking me for a ride up and down Kelfield on your Triumph bike – I was scared stiff and so was leaning the wrong way, Funny thing is I was thinking about your family a few weeks ago when I had walk down St Anns Road and saw that the Kenilworth Castle pub is now a Co-op supermarket – I think you moved over that way from Kelfield. Love this blog. I lived at 44 then 31 Kelfield, before moving to Dubai & Australia. As a Heritage Architect I was very interested to know why several houses were built as apartments. I have experienced this before at Holy Lodge, where special apartments were built post WWI for war widows and was wondering if this had been the situation with the last houses to be built as they sound more like apartments than flats.